Our Overland Park location is at 1101S Metcalf Avenue, Overland Park, KS 66210. The Overland Park center is located in the heart of Johnson County! Take the Met calf exit and head south. We are located on the Northeast corner of College & Metcalf in the Financial Plaza IV Center. This location is very easy to get to. Our manager at Overland Park is very customer oriented and wants to ensure that each client has a positive experience. She has been in the weight loss industry for many years. The great staff there do individual counseling sessions with all client to increase weight loss and energy levels. We want all of our clients not only to lose the amount of weight they would like to lose, but to keep that weight off for their lifetime. 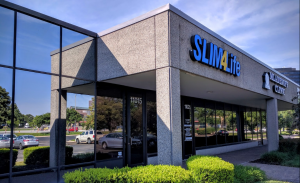 If you drive the southern part of the 1-435 loop, come see us at Overland Park and see how our individualized weight loss program can help you be Slim4Life! Make an appointment at our Overland Park weight loss center today!